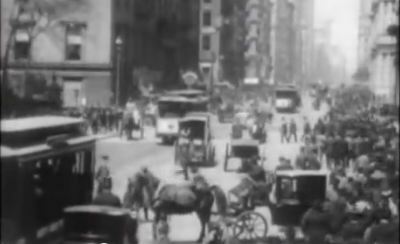 I just came across this video of the oldest surviving footage of New York City, and thought it was too fun not to share. Ignore the dodgy music and have a look! It shows grainy black-and-white scenes from as far back as 1896, with the oldest ever clip saved for the end. For me, the most interesting part is at 2:35 on the video — it shows where the World Trade Center would be built before there was a skyscraper in sight. And how on earth did the streets look so much cleaner back then?! Do you recognize any of your favorite spots? Such a great find, Lydia! My very favorite place is featured (NYPL! ), and I really loved watching the subway tug right along its tracks! Crazy how much the city can change in 100 years!!! Wow, that is so cool! Thanks for sharing!